EasyCGI Review 2019: Is EasyCGI a Good Hosting? 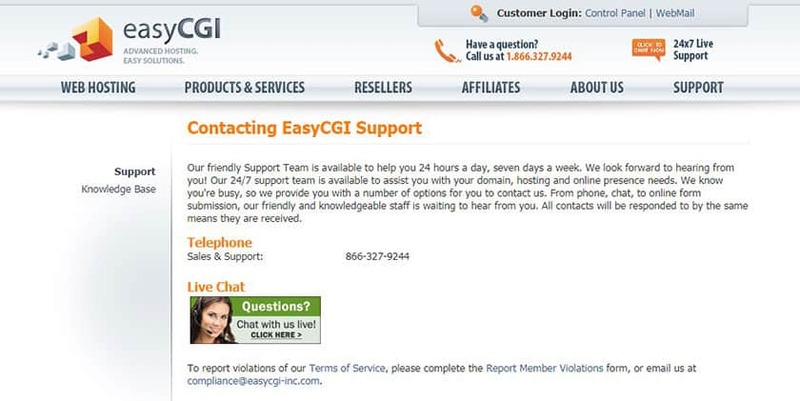 EasyCGI is one of the many web hosting companies owned by Endurance International Group. With a beginner-friendly outlook, they provide businesses with above-average web hosting solutions that can take just five minutes to set up. Founded in 1996, EasyCGI provides web hosting services to various business sectors, with particular relevance to e-commerce businesses. Although based in the U.S.A., they serve clients all over the world with web forwarding, shared hosting, VPS, email hosting, and associated products and services. EasyCGI offers Windows-based shared hosting and Linux-based VPS hosting. EasyCGI’s noteworthy add-ons to their web hosting plans include custom error pages, support for several programming languages, website analytics tools, free SSL certificate, and RAID infrastructure. Their hosting packages are mid to high range, which maybe makes them unsuitable for startups and smaller businesses. Nevertheless, I noticed that they have turned launching an e-commerce website into an easy plug-and-play process that includes the ECwid shopping cart, an inventory, shipping management, and product sourcing. While their hosting packages are not perfectly suited to beginner businesses, EasyCGI is nonetheless very beginner-friendly as the name suggests. They provide a drag-and-drop website builder along with goMobi (a mobile website builder) so you can create responsive mobile-friendly websites in minutes. I’m particularly taken with their take on security. The ‘site lock’ feature automatically scans your website to remove malware and harmful code, and two firewalls plus 24/7/365 security protects their data centers in Boston. Although EasyCGI’s plan prices are pretty standard, there are no low-tier offers for small businesses. This may well be because their sister brands provide many low-tier plans. Unlike most web hosting companies, there is no free domain name with any plan, but this is not a bad tradeoff for the enormous space provided. If you choose any VPS plan, you can effectively try before you buy, by paying month-to-month until you’re ready to commit to a year or more. Customer support is superb, as I discovered by receiving a prompt and helpful response via live chat. You can also use their online ticketing system, phone support, and the self-help knowledge base aimed at both new and advanced webmasters. EasyCGI offers easy to navigate above-average web hosting features at industry standard prices. The huge space provided on their plans could be their biggest plus. Wondering how EasyCGI stacks up against other Web Hosting companies? Enter any other Web Hosting company and we will give you a side-by-side comparison.